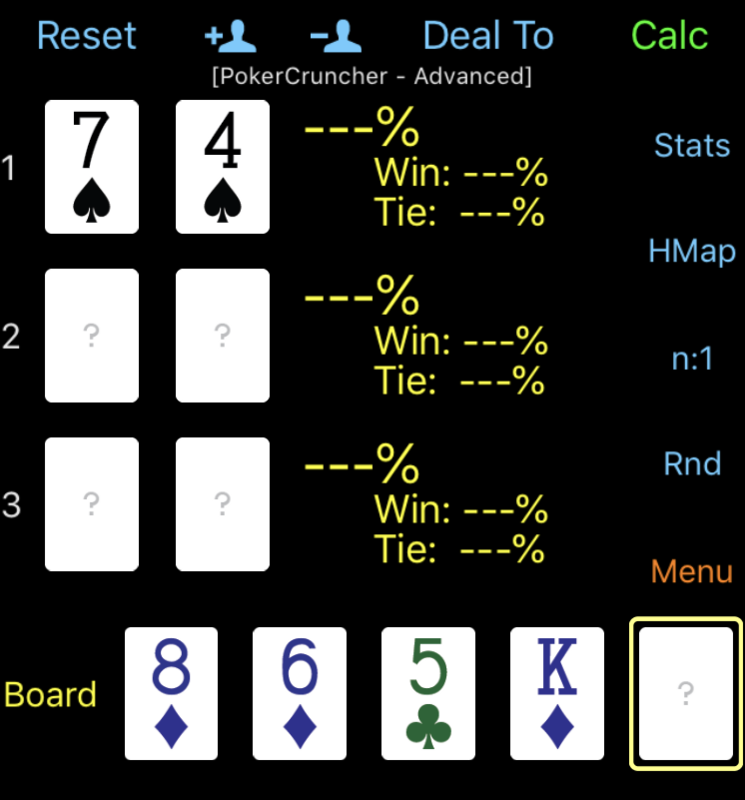 In my last post, I summarized six recent poker hands that I lost with top two pair or better. In five out of six, I had a set, straight or flush and still lost. What hurt most was the stubbornness of ignoring very specific reads in several of these spots. I could have, and should have, folded and saved my chips; instead I paid off multiple river bets or raises. I was the small blind with 7♠4♠. Three players limped in, I completed and the big blind checked. Flop (5 BBs): 8♦6♦5♣. Clicking the universal ‘like’ icon… I lead out with a pot-sized bet. I’m ahead of his range. Heads up against that range, my equity is 63.6%. But what about James? His range is probably wider than Todd’s, but will include all of these same hands. Could he be lying in ambush with the 97? I consider making a large re-raise, at least 4x Todd’s bet. We both have well over 150 BBs on the table. Perhaps due to a semi-conscious desire to keep the pot smaller after so many recent coolers as described in my last post, I just call. In the moment, I didn’t feel like gambling in a big way, wanted to see if James would hang around for the turn card, and wanted to see a safe turn card before getting heavily committed. And calling is the more deceptive play, right? James does call again. Turn (42 BBs): K♦. This completes any flush draws and becomes the second inflection point, a pivot from scheming to maximize value to minimizing pain. I check, James bets approx. 1/2 the pot, and Todd takes a moment before calling. It’s an easy fold, made even easier by having spent some time earlier in the day reviewing the hands from the last post and considering how to be better prepared to let go when the alarm bell rings again. There is a rest of this story. The river card was another 8, leaving the final board 8♦6♦5♣-K♦-8♠. James bet again, then Todd announces he is all-in. Later stating he had a flush, James figures out he’s beat and folds. Then Todd proudly flips over 88, not only scooping this pot but also taking the lead for a high hand jackpot that will be worth over 100 BBs a little over an hour later. In the strictest poker strategy sense, I think the “correct” play on the flop would be to re-raise after Todd’s raise. I had the 2nd nuts at that point and should take advantage of the tendency of the villains to call large bets when chasing big draws, even when the odds don’t justify it. But this morning, sitting in my cushy chair at home sipping on some green tea, I have the benefit of hindsight and peace that I didn’t opt for the high variance play this time.